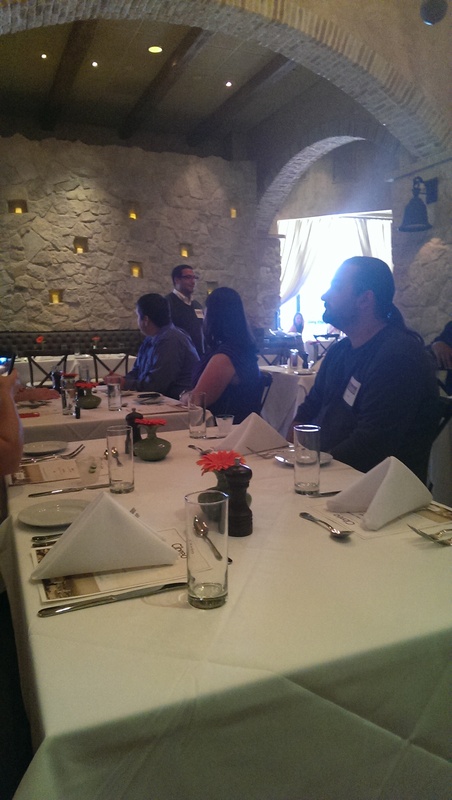 I was honored to be invited to a soft opening chef’s tasting at Cibrèo last week. It officially opened yesterday. Cibrèo is the latest creation of the Driftwood Restaurant Group, which operates Washington Place Bistro, the Welshfield Inn, Hodges, Orchard House, and 87 West at Crocker Park. After taking advantage of the free valet (especially welcome when the surrounding parking lots were charging $10 due to the Indians game) we were immediately blown away by the ambiance of the place upon walking in. Gone are the darker fixtures of Bricco and in their place are light-colored sandstone, brick archways and oak barrels, which are reminiscent of a Tuscan wine cellar. I adore Tuscany, so I immediately relaxed as soon as we walked in (and after braving the Indians game traffic I needed to relax!). A fire was roaring in the corner, and there were flickering (flameless) candles in recesses inside a massive sandstone wall on the north side of the room. I particularly loved that feature. The new location seats 200 people, with private rooms that can seat up to 125. 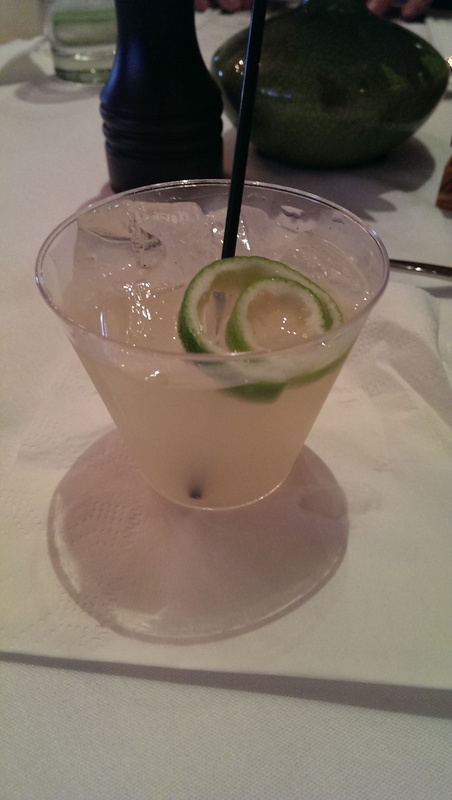 We were welcomed with a small feature cocktail, the Paloma Italia, which features Milagro Reposado tequila, fresh lime juice, and Grapefruit San Pellegrino. It was light and refreshing, and although I am not a huge fan of grapefruit I really enjoyed it. I can’t wait to try some of their other cocktails, such as the Jack Lemmon (Caravella Limoncello, Plymouth Gin, ginger, mint, and Fever-Tree Bitter Lemon Soda – I LOVE Bitter Lemon soda! ), the Sophia Loren (OYO Honey Vanilla Bean Vodka, egg white, chocolate, Fragelico and cream) or the A&W (1792, vanilla and root beer). They hoped to have the liquor license by the time they opened. 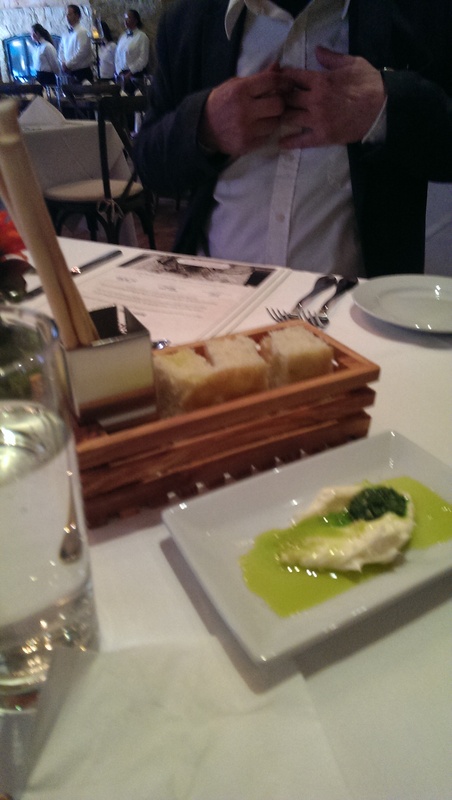 The bread service featured sea salt, butter and pesto drizzled lightly with olive oil. The bread was easy to dunk, and they also served bread sticks. The first course was sausage, porcini mushroom and bean soup. It was delicious. It was somewhat spicy and made me appreciate the sausage, mushroom, beans and kale of it all. I could see trying to recreate something like this at home – very simple and fresh ingredients. 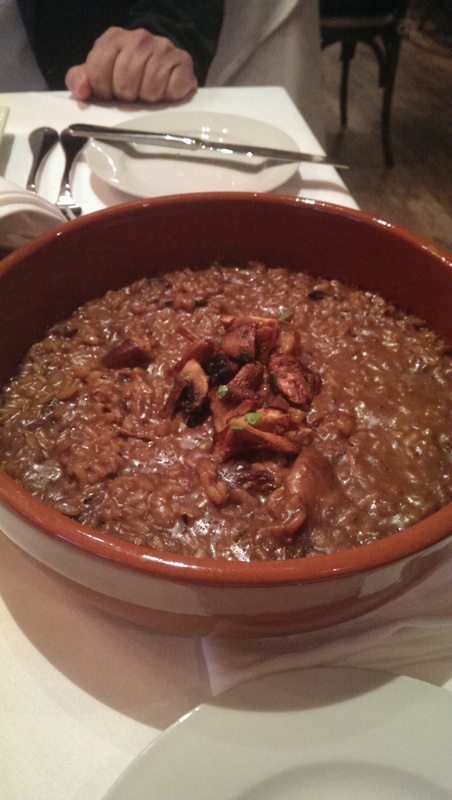 The second course was an earthy Risotto Funghi. If you like mushrooms you will enjoy this. I’m still on the fence about it. 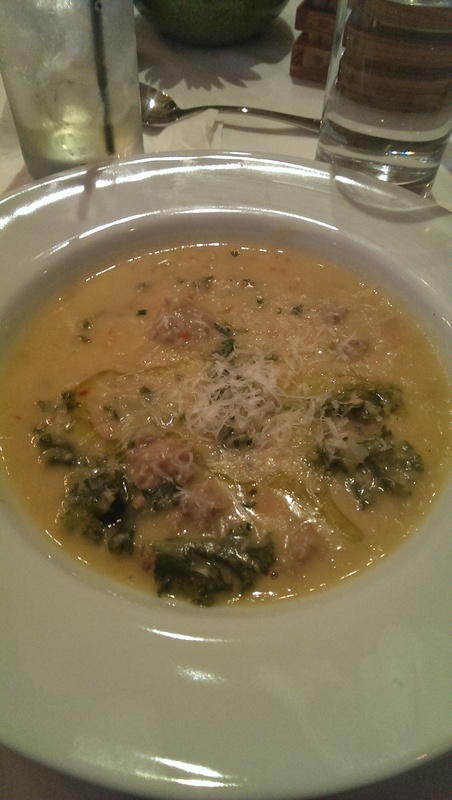 It had a very creamy texture, as a good risotto should be. It was definitely flavorful, but the earthiness of the mushrooms were a bit overwhelming. If you love mushrooms you will definitely love this dish. The added shaved fresh parmesan brightened it up. It features porcini and shitake mushrooms, truffle, and pecorino toscano cheese. It came out served family style, but we only ate half to save room for the remaining courses. 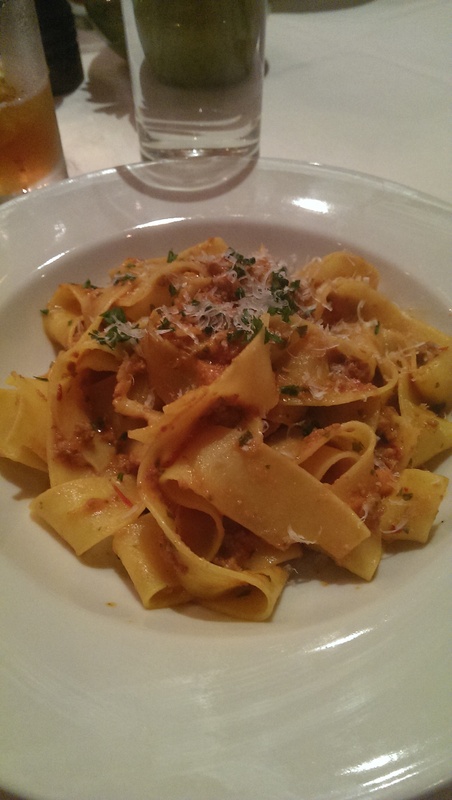 The third course was a bolognese of veal, pork and beef served over fresh pappardelle that they import from Italy. I may or may not have wanted to lick the plate clean. As Chef Erik Martinez explained, a good bolognese should not be dripping in sauce. It should stick to the pasta, and there should not be anything left over when you are done. I am a huge fan of Bolognese, so I enjoyed this course a lot. 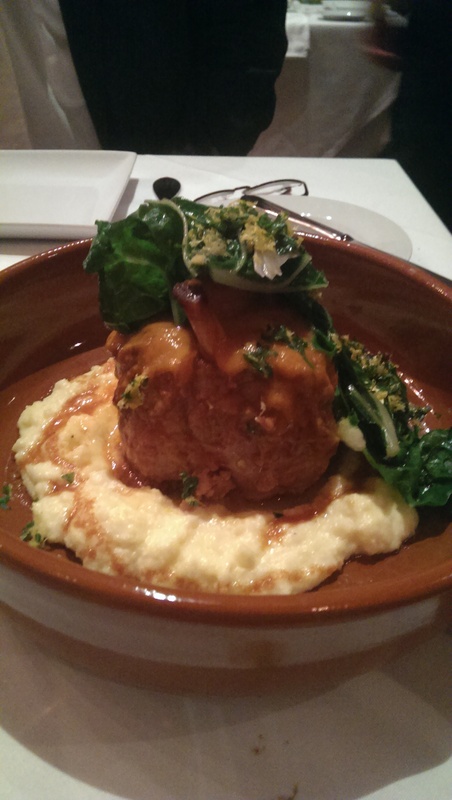 The fourth course – the Pork Osso Buco – blew everyone away. Paired with a glass of white Vernaccia wine (which honestly surprised me but it complemented it well), it had a light gremolata glaze that featured hints of citrus. Gremolata is a chopped herb condiment typically made of lemon zest, garlic, and parsley. This one was heavy on the lemon zest, but it provided a nice contrast to the richness of the meat, but didn’t detract from it. The meat immediately fell off the bone when I went to cut it in half to share with my tablemate. It was served with brown butter polenta and Swiss chard. OMG, the polenta was DIVINE. I am not a fan of polenta normally, and I would order a heaping plate of this as an entree if I could. We were offered gelato for dessert. Judging from some of the other reviews they made a lot of different gelato flavors. Our table was offered passion fruit and Nutella. I was stuffed, but there’s always room for gelato – just not room for two different kinds. 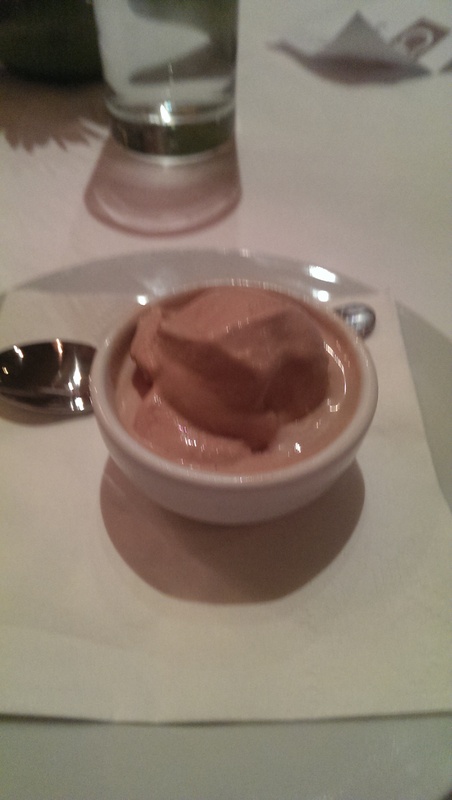 The Nutella gelato was as creamy as a good gelato should be and was sufficiently chocolatey and hazelnutty. As Nutella should be. It was the perfect end to a delicious meal. I can’t wait to go back and try some of the other things off the menu. Can you say boar and porcini ragu over pappardelle? To quote George Takei, “Oh myyyy!” But I will be sure to order the polenta! It’s available as a side dish. As a Broadway series subscriber I’m at PlayhouseSquare a lot. I will be visiting frequently, and look forward to sitting in front of the fire this winter. 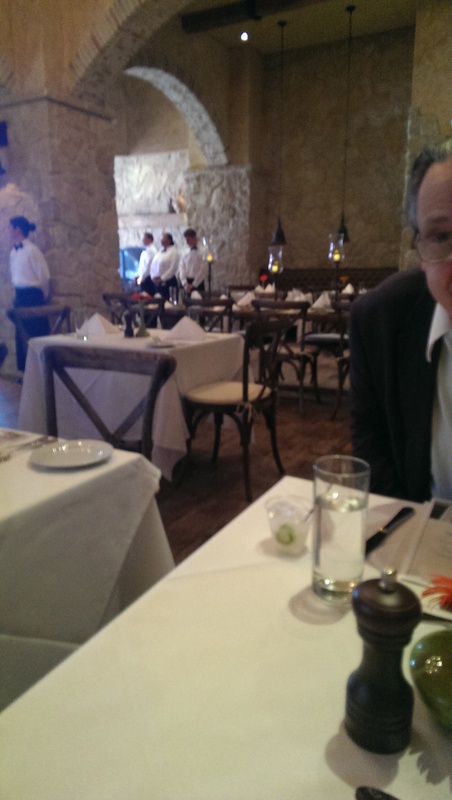 Disclosure: I was invited by Cibrèo to attend the Friends and Family preview with a guest. However, all opinions are my own.